At Valet Canberra, we offer the innovative Hide-A-Hose system to solve the problem of carrying and storing a ducted vacuum hose. Thanks to our retractable central vacuum hose, you’ll never have to carry or store a bulky hose again. Simply pull out the amount of hose you need from the inlet valve, connect your cleaning wand (with attachment), and begin vacuuming. When you’re finished, simply detach the cleaning wand from the hose, and the suction from the ducted vacuum power unit will retract the hose into the SmartTube™ system. 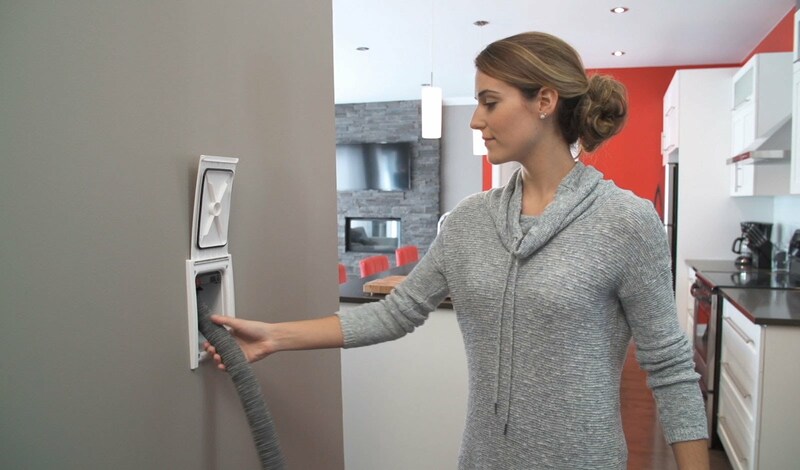 Our SmartTube™ system, hidden within the walls, attic or crawl spaces, stores the ducted vacuum hose. Special tubing sweeps allow the hose to travel freely within the tubing. Inlets can be installed within any standard wall cavity, and hose lengths of 9, 12 and 15 metres are available. Each inlet can cover up to 230m². All the tubing is connected to a central power unit usually placed in the garage, basement or equipment room. Installation is suitable for new constructions as well as retrofitting of existing homes if there is access to run the piping network required. Installation for newer and existing homes is simplified with the reduction of inlet valves needed on each floor. Fewer inlets will save time and make vacuuming more convenient. Our system also eliminates bulky ducted vacuum hoses. No more dragging a hose from inlet to inlet, and no more carrying, coiling and storing a bulky hose again. Simple cleanups are made easy! All the tubing is connected to a ducted power unit usually placed in the garage, or utility room. Installation of our retractable central vacuum hose is obviously easier for new constructions, however it can also be retrofitted to existing homes. Is This Only for New Construction or Can My Home Be Retrofitted? As long as there is access, the system can be installed in most homes. Your local installer would need to visit your home to make sure it can be done. Can You Retrofit an Existing Ducted Vacuum System? While the answer is yes, most of the plumbing used by your existing system will have to be replaced. The reason is that standard ducted vacuum systems are plumbed with standard 90’s fittings that prevent the hose from travelling through the tubing. Because the retractable central vacuum hose system actually stores the hose in the PVC tubing, special sweep 90’s and 45’s are required which allow the hose to travel through the tubing. Also, you have to make sure that your ducted vacuum unit is powerful enough to drive the system. The Hide-A-Hose retractable ducted vacuum hose system harnesses the suction from the Power Unit (usually installed in the garage) to retract the hose back into the PVC tubing hidden within the walls or floor space of your home. A standard ducted vacuum system uses a 9 metre ducted vacuum hose, as anything longer than that is just too big to carry and store. With the Hide-A-Hose retractable central vacuum hose, a 9, 12, or 15 metre hose can be used. The benefit is that with a longer hose, the number of inlets needed is usually reduced by half. Fewer inlets will save time and makes vacuuming more convenient. The main benefit of a hose sock is to prevent furniture and woodwork from getting scratched by the hose. Each hose comes standard with a hose sock. The sock actually stays cleaner than a hose sock fitted to a standard ducted vac system. Hose socks picks up dirt and dust from floors while vacuuming. Every time the power unit is turned on and the hose is in the wall, the suction from the power unit is continually cleaning the hose. That doesn’t happen when the hose is sitting in a closet. The system can be turned on by a low voltage switch at each inlet. The ducted vacuum hose system can also be turned on and off by an optional remote control (rf) switch. Can I Use Any Type of Power Unit? As our retractable central vacuuming hose system utilises the vacuum generated by the power unit to work properly, the power unit required normally is a higher rated unit in terms of its power in vacuum and airflow. Given longer hoses can be used with the system, airflow becomes important also, and units with higher airflow and overall vacuum are normally specified. Your installer will recommend what system is required.